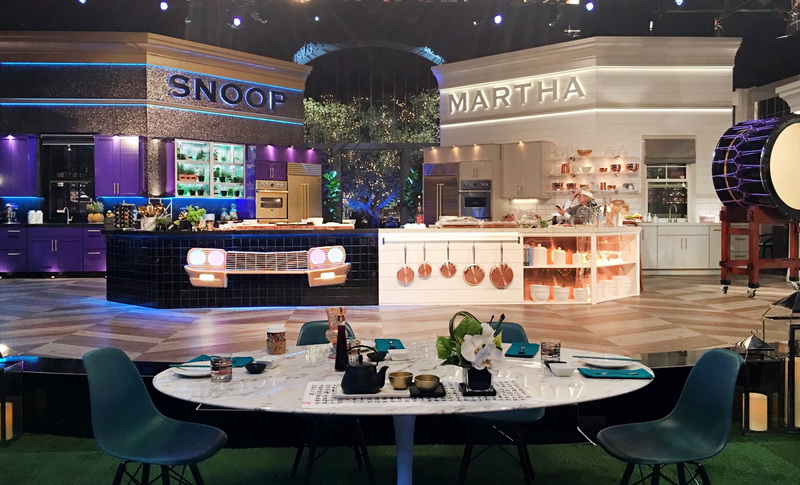 Domestic diva Martha Stewart and rapper Snoop Dogg might seem like they go together about as well as oil and water or orange juice and toothpaste — but creating a studio environment for the pair was a challenge designer James Connelly was eager to tackle. “You have a show that’s hosted by two completely opposite bookends of talent. What do you do design wise for that?” said Connelly, who pulled an all-nighter brainstorming ideas. The solution, it turns out, was extending an olive branch — or, in this case, an oak branch. The set design process for what would become “Martha & Snoop’s Potluck Dinner Party” had hit a bit of a roadblock, with the production team unsure about the direction the set for the VH1 late night variety show centered around food should take. The question, at that point, was whether a unified space or yin and yang was the way go to. It turns out the key was a space that allowed both Stewart and Snoop’s personalities to shine through on the respective parts of the set, while creating cohesiveness with similar footprints, layouts and design elements. The twinkling cityscape behind the oak tree both metaphorically and figuratively wraps behind the two personality-packed kitchen sets — with Snoop taking camera left and Stewart camera right.